To enhance the highly successful Mazda RX-8, Mazda engineers focused on innovation in three key areas for the new Mazda RX-8: styling, performance and packaging. "The enhancements made to Mazda RX-8's exterior, interior, safety, packaging and performance takes it to a whole new level of visual and driving excitement," remarked Nakazawa. Mazda RX-8 was designed with an athletically sculpted exterior that provides a sense of originality that's unrivaled in the marketplace today. The new Mazda RX-8 receives design enhancements that are meant to freshen the styling and give Mazda RX-8 a new look, without impairing the basic design theme. Refinements for the new Mazda RX-8 include restyled front and rear bumpers and front fascia; sporty, high quality finish front and rear headlamps; and larger exhaust pipes (now measuring 90 mm across). 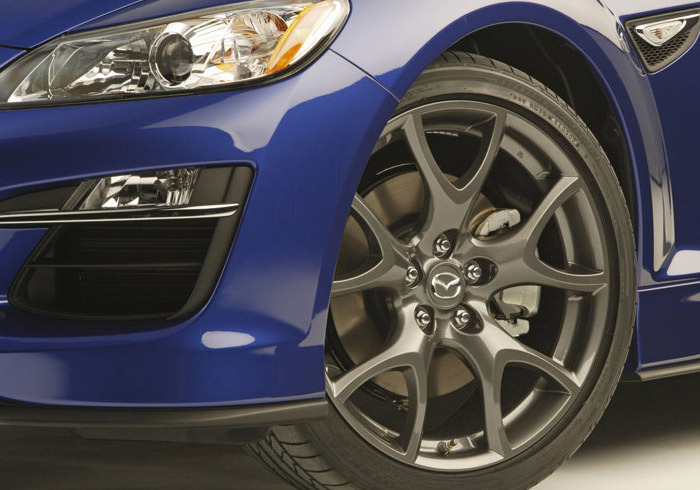 The new Mazda RX-8 also offers a new five-spoke wheel design featuring a symbolic and sporty design reminiscent of the rotary engine, with different arrangements for each wheel size. The RX-8's unique "freestyle" four-door design is proof that a true sports car does not need to sacrifice space or convenience for performance. The advanced design of the rear-hinged rear doors provides a large door opening, allowing adult-sized passengers to easily enter and exit the vehicle. 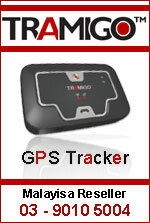 This design is also advantageous when securing a baby or a small child in the back seat. With a spacious rear seat area providing ample passenger room for four full-size adults, and enough trunk space for a weekend's worth of luggage, this sports car proves its versatility. The Mazda RX-8's exterior styling presents a genuine sports car form, while the interior boasts a comfortable and intelligently designed cabin. Minor enhancements were made for the new Mazda RX-8 to provide a simple and functional interior design that supports driving pleasure. The center IP shape was redesigned to give a feeling of dynamic movement, a variable red-zone was added to the tachometer that will rise as the engine comes to operating temperature and a new steering wheel and redesigned front and rear seats are also added. The rotary design element is incorporated through the interior of the Mazda RX-8 in creative ways, appearing in the seats. The stylish cabin also evokes a sense of luxury and high-end quality. Mazda's design team examined every aspect and component of the interior and has created an elegant, driver-centric atmosphere. 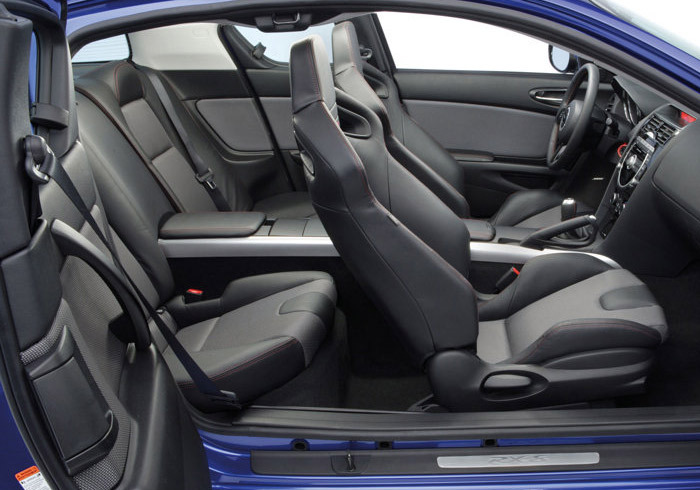 Through the use of advanced ergonomic research, Mazda engineers determined that improper seating posture is a major cause of driver fatigue and built in optimum support in the front seats to help offset discomfort. 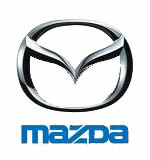 In addition, the color of the Mazda RX-8's instrument cluster was developed to reduce eye fatigue and strain. 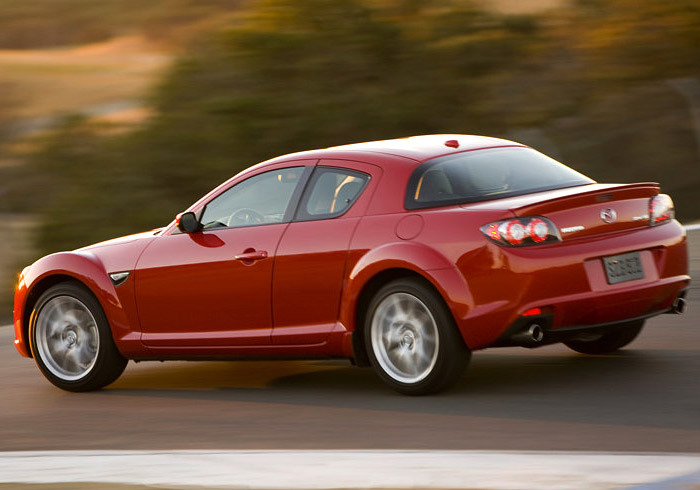 Through-and-through, the Mazda RX-8 is a pure sports car that gives the driver an exciting and dynamic experience. For the new Mazda RX-8, engineers improved body rigidity through the addition of structural reinforcements, by adding a trapezoidal strut tower bar and enhancing the local rigidity of the front suspension tower areas. Also, the rear suspension geometry has been reconfigured for better handling performance and driveshaft rigidity is improved, lowering NVH levels and improving performance. In addition, the differential gear ratio on manual transmission-equipped cars is lowered from 4.444 to 4.777 for improved off-the-line performance. 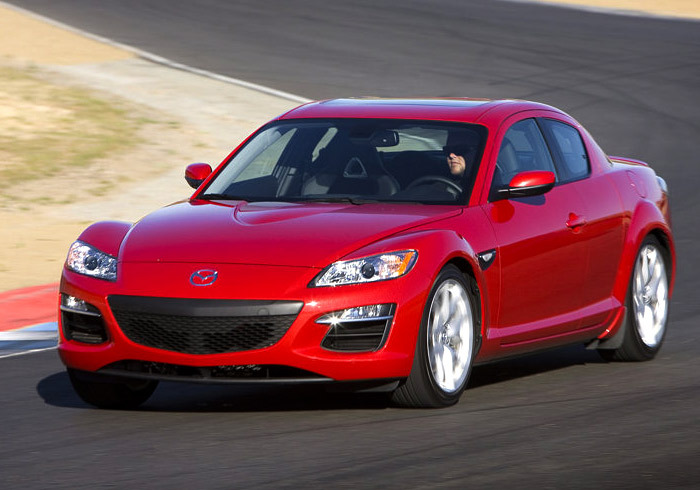 While minimal, these performance changes give Mazda RX-8 increased acceleration and performance, as well as even greater responsiveness to the accelerator pedal - always a rotary-engine and Mazda RX-8 hallmark. To achieve this sophisticated dynamic, Mazda utilizes the advanced RENESIS (Rotary Engine genesis - or rebirth of the rotary engine) engine. 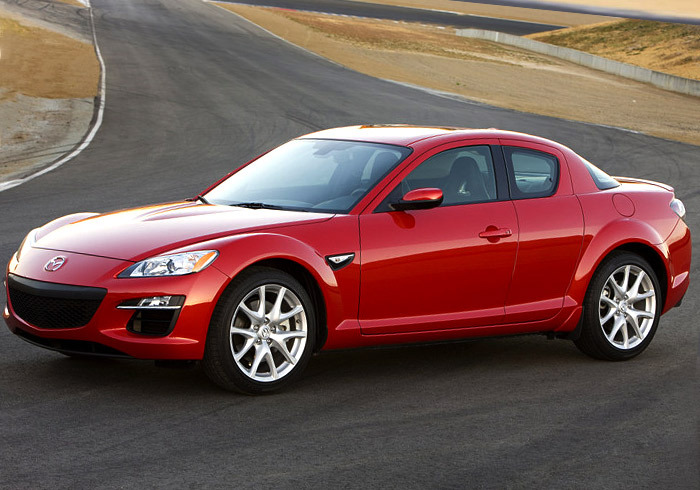 The Mazda RX-8 remains the only mass-produced rotary-powered passenger car in the world. While exhibiting unusually high power output for a naturally aspirated engine, RENESIS outstrips comparable reciprocating engines in terms of acceleration, the feeling of power in reserve and quick response. The new Mazda RX-8 is available as either a 232-horsepower model fitted with a sixspeed manual transmission, or a 212-horsepower model fitted with a six-speed Sport A/T automatic with steering-wheel-mounted paddle shifters for a Formula 1-style driving experience. By turning a triangular rotor in a cocoon-shaped combustion chamber, the Mazda RX-8's rotary engine efficiently performs the four processes of intake, compression, combustion and exhaust. 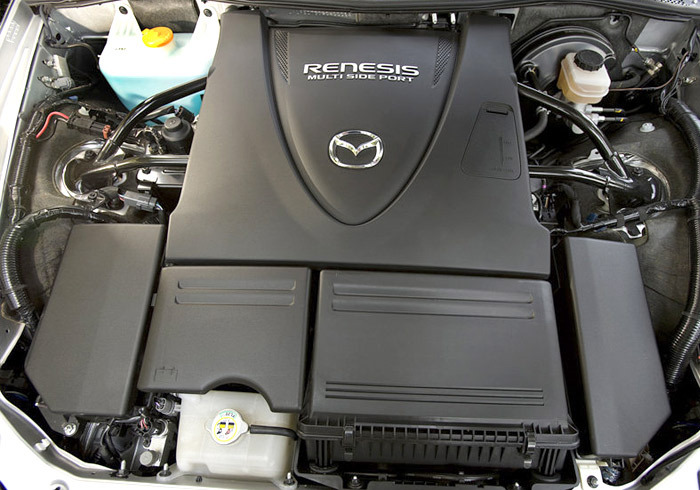 The RENESIS engine is remarkably smooth and high revving all the way to 9,000 rpm (7,500 rpm on Sport A/T-equipped models) and offers a smaller engine footprint than traditional internal combustion engines (some 60 percent smaller and lighter than a comparably powered V-6, and 40 percent smaller and lighter than a four-cylinder). In fact, the packaging and styling that define the Mazda RX-8 would not have been possible had Mazda engineers chosen a conventional piston engine. The Mazda RX-8's normally aspirated 1.3-liter engine might appear diminutive to the untrained eye when compared to large-displacement V-8s or heavyweight V-10s or V-12s. However, through the incredible efficiencies of a rotary powerplant, an advanced three-stage intake system and an electronic throttle, the RENESIS engine delivers smooth, linear power on a grand scale. The Mazda RX-8 uses an aluminum double-wishbone front suspension, reducing unsprung weight over the use of steel components. By mounting the upper and lower arms on a highly rigid sub-frame, the long arms ensure linear alignment changes throughout the jounce and rebound of the front wheels. All corners are fitted with mono-tube gas-filled shock absorbers designed with large-diameter internal pistons and valving, which offer excellent road feedback and a smooth ride. An electric rack-and-pinion power-steering system transmits just the right amount of road information back to the driver. Mazda engineers have chosen to pursue their own path by using an electric motor for steering assistance rather than a conventional power-steering pump. The electric motor provides additional assistance at low speeds to ease parking and reduces steering assistance at higher speeds to provide greater road feel, responsiveness and feedback. And, in keeping with the rest of the development on Mazda RX-8, it is far lighter and easier to package than a conventional power-steering rack. 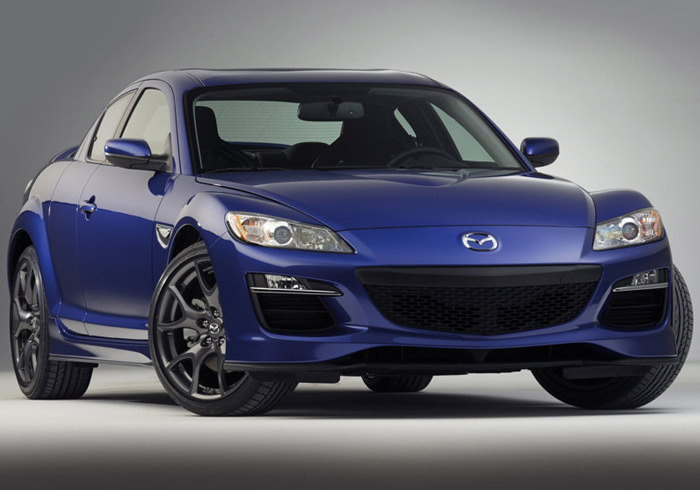 To cater to the driving-conscious enthusiast, the new Mazda RX-8 will offer a new R3 sport package. Providing the very best in rotary-powered motoring, the R3 harkens back to the R1 and R2 packages offered on the mighty third-generation Mazda RX-7, and adds a sport-tuned suspension with Bilstein shock absorbers and front suspension crossmembers filled with urethane foam. Filling the crossmembers makes for a smoother ride, minimized NVH and greater suspension control. On the visual side of the package, a rear spoiler, side sills, fog lights and sporty front bumper are added to give an aggressive appearance, along with 19-inch forged aluminum-alloy wheels with high performance tires. Inside, the R3 adds a 300-watt Bose? audio system with Centerpoint? surround sound and AudioPilot? noise compensation technology, Bluetooth hands-free phone system, front Recaro sport seats with leather side bolsters, leather-wrapped parking brake handle and Mazda advanced keyless entry and start system. All Mazdas come with a roadside assistance program. With a call to a toll-free number, owners can access roadside assistance 24 hours a day, 365 days a year throughout the United States and Canada. In addition, a comprehensive three-year/36,000-mile warranty covers every part on the vehicle except those subject to normal wear. Also, all models receive a fiveyear/ 60,000 mile powertrain warranty and a five-year/unlimited-mileage corrosion warranty. For Mazda, the safety process incorporates both accident avoidance and accident protection. In rollover tests performed by the National Highway Traffic Safety Administration (NHTSA), the Mazda RX-8 achieved an impressive five-star rating. 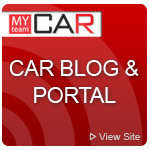 Mazda engineers integrated numerous active and passive safety elements throughout the car. Active safety features, which require input from the driver, include the use of large ABSequipped disc brakes on all wheels as well as precise steering and suspension systems. Dynamic Stability Control (available on Sport models with Performance package, standard on Touring and Grand Touring) delivers a superior level of handling that can be disabled when driving and road conditions allow safe operation. Passive systems, or those that take effect automatically without the driver's involvement, also are present throughout the Mazda RX-8. Despite the absence of a center B-pillar, the Mazda RX-8 has an exceptionally rigid body, accomplished through the use of the vertical pillars built in the rear doors and a series of locking pins, which hold the doors together and bind each door directly into the roof and floor. Integrating the frame components helps dissipate crash energy through the vehicle's structure. Other standard passive systems on the Mazda RX-8 include front airbags, seat-mounted sideimpact airbags and side-curtain airbags. Additionally, the front end and engine bay have ample crumple zones, the front seats are designed to reduce whiplash injuries, the brake pedal is designed to break away in the event of a collision of sufficient force to protect feet and legs and all four seating positions are fitted with three-point seatbelts. Even pedestrian protection was considered, as the RX-8 is fitted with Mazda's "shock-cone" hood design that yields more to the impact of a pedestrian onto the hood than a standard design, yet is strong enough to not deform in normal use. 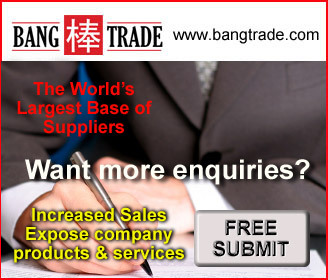 Table shown below is Madza Rx-8 price list in Malaysia.